Joan Michels, of Earling, Iowa, explained her water treatment process on Aug. 19, 2016. The treatment process includes reverse osmosis (blue tank) as well as a UV light (silver tank) to get rid of bacteria for the water she uses for drinking and cooking. The other water in the house is just treated with a water softener. She said she had the system installed about four years ago after growing tired of having to bring in water from town or buying bottled water. Her water had high levels of nitrogen as well as trace levels of arsenic and lead. Roughly 288,000 Iowans rely on private water supplies but may not know what is in their water because their wells’ water quality is unregulated. Moreover, many well owners IowaWatch spoke with during an investigation this past year in counties across southwest Iowa said they largely were unconcerned about their wells, even though tests revealed high levels of nitrates and bacteria in some of their wells. That could put their health, and the health of their families at risk. IowaWatch spent the past year researching wells and testing samples looking at four common contaminants: nitrogen, bacteria, arsenic and lead and, similar to a number of scientific studies in the past, found a large percentage of wells with high nitrate and bacteria levels. 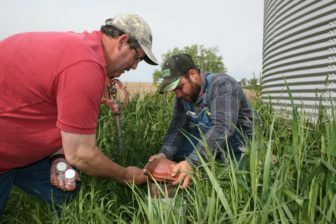 Nitrate levels in 28 wells IowaWatch, a nonprofit, nonpartisan news organization, tested in May and June ranged from the acceptable level of less than 1 milligrams per liter to, at one rural home, 168 milligrams per liter. The State Hygienic Lab measures nitrogen levels using nitrate (NO3) and the acceptable level for that under U.S. Environmental Protection Agency health standards is 45 milligrams per liter, although the level usually referenced for nitrogen is 10 milligrams per liter. Eleven of the wells IowaWatch tested in May and June had nitrate levels above 45 milligrams per liter. Two more tested at 43. Fifteen wells showed unsafe bacteria levels. A handful also had trace amounts of arsenic and lead. Many county sanitarians who test well water for common contaminants like bacteria and nitrogen said they struggle to get well owners to understand the importance of testing their water regularly, even if it looks, smells and tastes fine. “What’s out of sight is out of mind,” said Sherry Storjohann, an environmental health specialist who has been testing wells in Iowa’s Crawford and Carroll counties for the past 25 years. While some contaminants — like bacteria — may not necessarily be a health concern in-and-of-itself, they are an indicator of a well susceptible to contamination from the outside. Outside contaminants can include runoff from agricultural fields, septic system leaks and animal infestations, such as when mice, snakes or other creatures crawl into an unsealed well. In some cases, natural events like flooding can also pose a risk to a well. High levels of nitrogen pose a health risk to infants in the form of blue-baby syndrome and some studies have shown increased risks for some types of cancers, reproductive issues, diabetes, and thyroid conditions. Arsenic and lead both pose a largely unknown risk at low levels. The Environmental Protection Agency puts maximum contaminant level goals, at which there is no known or expected health risk, at zero for both arsenic and lead. Infants and children exposed to elevated levels of lead could be impacted by delays in physical or mental development and adults can face higher risks of kidney problems and high blood pressure. Elevated levels of arsenic increase risks of skin damage or problems with circulatory systems, and may increase risks of cancer. Iowans who wish to test their well may so through a number of different channels, including requesting a kit from a laboratory like the State Hygienic Lab at the University of Iowa, taking a sample and sending it in. Or, in 98 of Iowa’s 99 counties, they can go through their county sanitarian and use a program called the Iowa Grants to Counties Program. When Jenny and Craig Melvin moved into their home outside Farragut, Iowa, they tested their well through their local county sanitarian. Results came back with high nitrogen levels – 74 milligrams per liter – and total coliform bacteria present. They shocked the well, which cleared up the bacteria, but the nitrates still were there. With one infant in the house both Jenny Melvin and the newborn used bottled water. 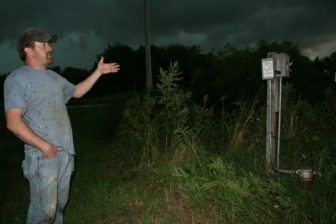 Craig Melvin talked about his well, located in a field a short distance from his house in Farragut, Iowa, on Aug. 19, 2016, as a storm rolled in. When Melvin and his family first moved into the house around Easter, they had to treat the water with chlorine to address some bacteria issues. The well, built in 1980, also had high levels of nitrogen and trace levels of arsenic and lead. IowaWatch testing also showed the Melvins had slightly elevated levels of arsenic and lead in their water – 0.002 milligrams per liter for both contaminants. Although the goal would be to have these contaminant levels at zero, the action level for lead in regulated, public water supplies is 0.015 milligrams per liter, and for arsenic the maximum contaminant level is 0.010 milligrams per liter. Although the two previously lived in town, with town water, they grew up in the country with well water. They said they’ve enjoyed not having a monthly bill and being able to do things like fill up an above-ground pool for their kids over the course of about four or five days without worrying about cost and without running out of water. The water from their well comes straight into the house without filtration. Craig Melvin said he’s not the type to get too concerned about the water, although he pointed to the location of the well as cause for some concern. It’s about 800 feet from the house in a low point in the landscape, surrounded by fields, near a runoff ditch. 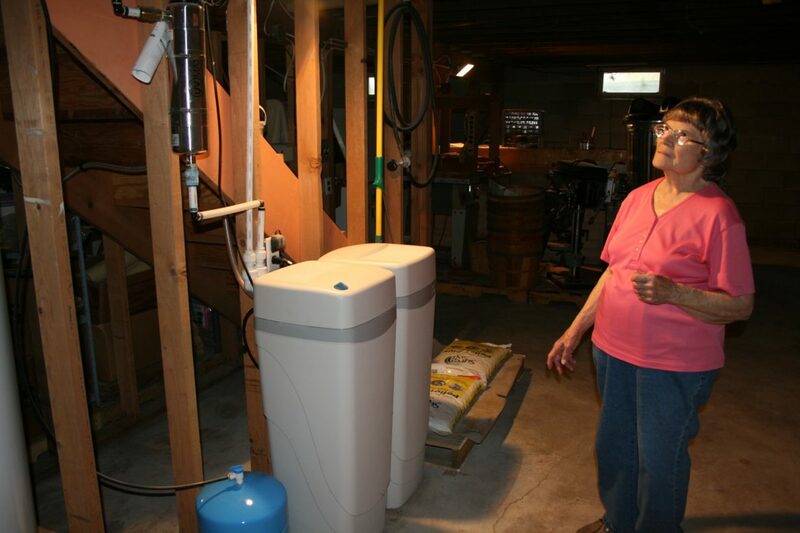 Joan Michels, who lives in Earling, Iowa, installed a reverse osmosis system and UV light about four years ago to help treat high nitrogen and bacteria levels, but she said she and her husband, who died in 2014, hadn’t drunk the water for years. Like many people IowaWatch spoke with, she was filling milk jugs and other containers with water from town. Further IowaWatch testing showed slightly elevated arsenic — 0.003 milligrams per liter — and lead levels — 0.005 milligrams per liter – in her water. The nitrate level was 86 milligrams per liter. 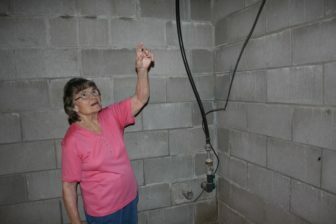 Joan Michels, of Earling, Iowa, points to the water lines coming in her house from the well outside. Michels said she didn’t know the exact age of the well, but it was there since at least the 1950s. Her husband first brought the water lines into the house in the 60s, before that the house had no running water. Photo taken Aug. 19, 2016. Michels said when she and her husband, Edwin, moved to Earling in the 1960s the house, which his parents also were living in, didn’t have running water. Water was carried from the well down in the field into the house, she said. When they moved in in the 1970s, they added running water and electricity. The Melvins raised their seven kids in the house. Still, she has the water tested every year just to be safe and to make sure the water treatment systems are working. 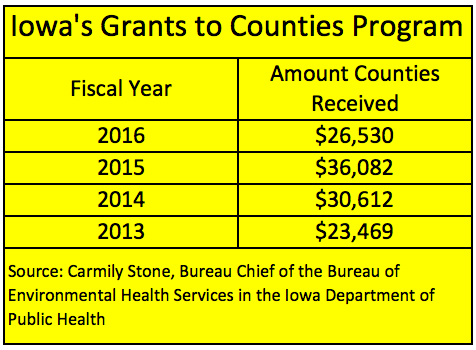 Iowa’s Grants to Counties Program, established in 1987 when the state Legislature passed the Iowa Groundwater Protection Act, provides funds for local county health departments to be used for an array of well-related services. 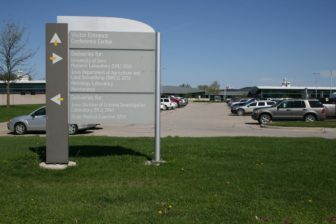 The program has several players, including the Bureau of Environmental Health Services in the Iowa Department of Public Health, which takes care of the financial administration, and the Iowa Department of Natural Resources, which takes care of some of the technical aspects like well contractor certification and maintaining a database of wells and water test results. All but one of Iowa’s 99 counties — Marshall County — participate. Carmily Stone, bureau chief of the Bureau of Environmental Health Services in the Iowa Department of Public Health, said the program was among her favorites of the services she oversees. The amount of money available through a grant, which comes from pesticide and fertilizer taxes, varies each year and is split evenly among counties. The funding can be used to cover private well water tests and administrative costs for, at minimum, total coliform bacteria and total nitrate tests, with an additional option added in 2015 that allows counties to perform arsenic testing. Services such as well plugging for up to $575, cistern plugging up to $375 and well reconstruction up to $1,330 also are covered under the grant. Most of the grant money for those services goes directly to reimburse well owner costs but some also goes to the county for administrative expenses. Counties also can use the grant to cover well-related training expenses up to $1,000, up to $500 for the cost of supplies and up to $1,000 for advertising and promotions to let people know about the availability of the well services. The grant does not cover expenses for water treatment systems. Some counties may choose to put all of the money into testing and services like plugging or reconstruction, while some divvy up the funds for supplies, training and promotional expenses as well. “Some counties don’t spend all of their money, and some counties go through their money rather quickly,” Stone said. She said the reason for different spending patterns may be based on the number of wells in a county, with less-rural areas or areas that have a rural water utility facing smaller demand for private well water services. In some cases, the reason may also stem from a lack of manpower. In visits with county sanitarians across southwest Iowa, IowaWatch observed some who covered multiple counties and responded to calls for well tests, pool water tests and tanning bed inspections, to name a few. While talking with IowaWatch in her office this past summer Shelby County Environmental Health Director Terri Daringeroften was interrupted by the ringing of her phone. Shelby County has been testing wells for 23 years. In addition to testing and permitting for wells and septic systems in Shelby County, her office handles food inspections for seven counties as well as swimming pool, tanning bed and tattoo parlor inspections in four counties. She said the county routinely uses all of its Grants to Counties money. Entrance for the University of Iowa State Hygienic Lab in Ankeny, one of three state hygienic lab locations. The other two are in Coralville and Milford, Iowa. However, the Legislature asked the public health department to find ways to spend down the fund more efficiently because of counties that don’t spend all of their money. The department added in 2016 a mid-year reallocation based on both current and past funding use. That plan would take money from counties that aren’t spending funds and give it to counties that already have spent their money, she said. Storjohann, the environmental health specialist with Crawford and Carroll counties, said quite a few people still are unaware of the available services despite her efforts to get information to well owners – including visiting county fairs, putting out newspaper ads and, more recently, sending out letters. “I’ve gotten to the point now in the last number of years where I actually send out a personal letter to homeowners trying to explain our services, hoping to generate that interest and make them understand the good service this is and what we can provide and that this is all for their benefit,” she said. Data accessed in April 2016 from the Iowa Department of Natural Resources’ Private Well Tracking System showed roughly 60 percent of wells in Crawford County and 40 percent of wells in Carroll County tested positive for total coliform bacteria. Statewide, about one-third of wells test positive for total coliform bacteria. 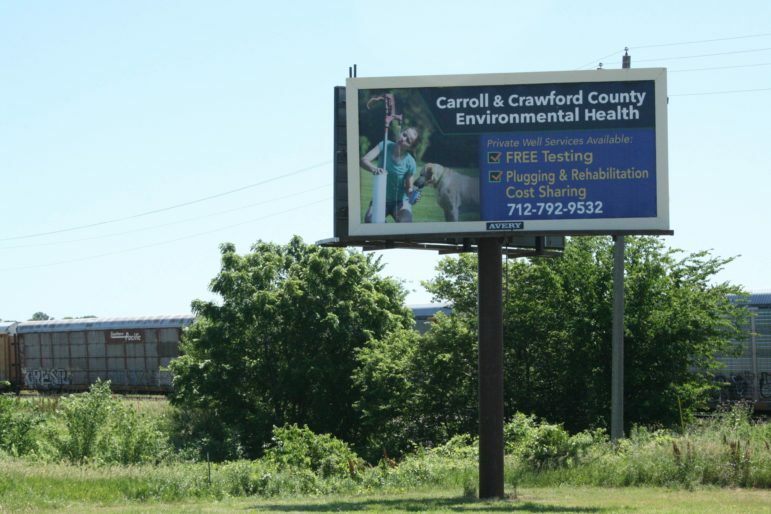 A billboard in Denison, Iowa, advertised well testing services on June 21, 2016. Crawford County wells also frequently tested high for nitrates, with about 41 percent returning failing testing results, compared to 13 percent statewide. Carroll County tested better, with about 18 percent returning failed nitrate tests. Storjohann said the difference likely lies in Crawford County’s shallower wells. She said it’s hard to explain to people why they should test their wells, in part because the wells and the aquifers they draw from often lie far below the surface, invisible. As science has yielded a better understanding of the potential for contaminants in wells and the impact those contaminants can have on health, the challenge is keeping people updated and informed on the importance of testing. Storjohann said both her parents and her grandparents followed the common practice of never testing their wells. “They were of the adage: ‘We’ve been drinking it this long, you know. It’s never harmed us,” she said. As kids, Storjohann and she and others used to drink from the hydrant of the shallow well on her grandparent’s farm. “I can’t imagine what we probably drank,” she said. Mills County Sanitarian Mike Sukup said he tests about 150 to 200 wells a year. A portion of those tests are people who get their wells tested regularly, but he said sometimes people are spurred to test their water when a family member gets sick or when they have kids. Richard and Ruth Miller said they’d been hearing about other people with contaminated wells and thought they should get their well checked, especially since they have grandkids coming over every week. The Millers live near Silver City in Mills County. IowaWatch tests this past summer showed bacterial unsafe levels of coliform bacteria at their home but barely a trace of nitrogen and no e.coli. “Some e.coli and nitrogen is probably not going to hurt me,” Richard Miller said. Still, they had their 1950s-era well rehabilitated after testing results came up in 2012 that showed unsafe levels of total coliform bacteria and they have their well tested regularly. They had their well tested for arsenic last year and the results came back negative, despite a smattering of wells in the area that tested positive, Sukup said. 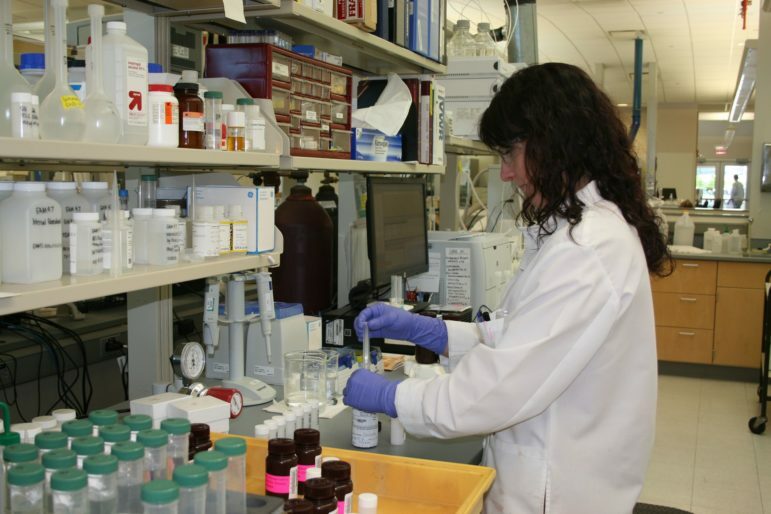 Hannah Lyons, an environmental lab analyst with the Iowa State Hygienic Lab, filtered samples prior to an arsenic speciation test, which can determine the concentration of each type of arsenic — arsenic V and arsenic III, which is more difficult to remove from water. Picture taken May 3, 2016. Although they have it tested, they said they don’t worry much about their water. “Nothing beats good, old country water,” Ruth Miller said. Connie Schroder, who lives in Pottawattamie County near Avoca, has had her water tested periodically in their well, built in 1920 and only about 40 feet deep, since the 1990s. She watched the nitrate results slowly tick upwards – from a safe 33 milligrams per liter, to 71 milligrams per liter in 1995 and 63 milligrams per liter in 1997, both of which are above the health advisory level of 45. In 1998, Schroder installed a reverse osmosis system on the kitchen tap and has used one ever since. IowaWatch tests at Schroder’s well this past summer indicated no coliform bacteria or e.coli. “I was having babies and wondering if we could use that water for formula. That’s what caused me to test it. That’s what was bothering me, the kids,” she said. When Cori Kragel’s dad, Gary Teut, was undergoing cancer treatment for small-cell lung cancer, she said he kept coming up with lung infections. They had the water tested and, when it came back with unsafe levels of total coliform bacteria, she wondered if that could have been part of the reason. Now, their Crawford County house has a whole-house filter for rust and iron and a UV light for bacteria. IowaWatch testing showed bacterially unsafe levels in the water but e.coli absent and a safe nitrogen level. Mike Stringham, assistant sanitarian in Cass, Audubon, Guthrie and Adair counties, looks at Wayne Royer’s well in Guthrie County on May 16, 2016. Royer’s doctor requested he get his well checked after he developed some gastrointestinal issues. Stringham estimated the well was from the 1950s and needed to be resealed around the top, where spiders had gotten in and built webs. Wayne Royer called Mike Stringham, an assistant sanitarian for Cass, Audubon, Guthrie and Adair counties, to test his Guthrie County well on the advice of his doctor. He had tested positive for cryptosporidium, a parasite that causes diarrhea, stomach cramps, nausea and fever. Royer had recently helped out on a nearby cattle operation with a cryptosporidiosis problem, said he thought the cattle, rather than his water, was the more likely cause. Stringham grabbed a water sample from Royer’s tap, which turned up clean, but he also took a look at the well itself. He pulled off the cap on the wellhead – a lidded cast-iron pipe that stuck up about a foot from the ground and was surrounded by tall grass. Spiders had built webs inside. “Insects are getting in there and mice could get in anywhere,” Stringham said, although he said he didn’t see any sign of mice. He suggested that Royer work to seal up the cap to prevent anything from crawling in and impacting his water. He said he has frequently seen mice as well as snakes, especially in brick or stone wells. This IowaWatch story was republished by the Council Bluffs Nonpareil, The Hawk Eye (Burlington, IA), The Gazette (Cedar Rapids, IA), The Valley News (Shenandoah, IA), The Fairfield Ledger, Mason City Globe Gazette, Guthrie Center Times, Environmental Health News, the Society of Environmental Journalists‘ webpage, Greenwire, and Midwest Center for Investigative Reporting under IowaWatch’s mission of sharing stories with media partners. Read an editorial from The Gazette urging people to test their wells or listen to a University of Iowa Center for Global and Regional Environmental Research podcast about this report. Age, depth and type of construction are three major factors in determining how at-risk a well is for contamination. Wells in Iowa run the gamut of different shapes and sizes. Well depths can range from 20 feet to 2,500 feet — although private wells often are shallower and wells tested by IowaWatch varied from 25 feet to over 200. Ages also can range from recent construction to wells put in with the first homesteaders. One well IowaWatch tested was estimated to be from the early 1900s. Russ Tell, a senior environmental specialist with the Iowa Department of Natural Resources, said aging wells are a common problem and at a higher risk for contamination, especially because the construction often is not up to modern standards. He said wells have a useful life, which can vary based on the type of well. He advised owners to test frequently and provide basic maintenance to make sure water from a well is safe. “A well shouldn’t be thought of as a permanent fixture on the farm that you put in one time and you get to forget about,” he said. When a well reaches a point at which the water no longer is safe to drink, he advised repairing or replacing it. Stringham said whether or not a well is replaced can sometimes depend on the economy and crop prices. “A lot of farmers, when the price of crops were high, if they had a bad or shallow well, they replaced it,” he said. If the cost of replacing the well is prohibitive, Tell pointed to materials that can help people figure out ways to treat their water or other measures to ensure that water they drink is safe. Some treatments can include UV lights, which kill bacteria by exposing it to UV radiation, or reverse osmosis units, which remove inorganic contaminants by forcing water through a membrane. Wells also can be constructed differently, with a number of older wells built in a way that makes them more prone to contamination. For example, many older wells, especially in western, southern and central Iowa, are labeled as “large-diameter bored or augered wells,” which can be hand-dug and lined with brick, stones, clay tile or concrete tile, which can let in contaminants like bacteria and nitrogen. 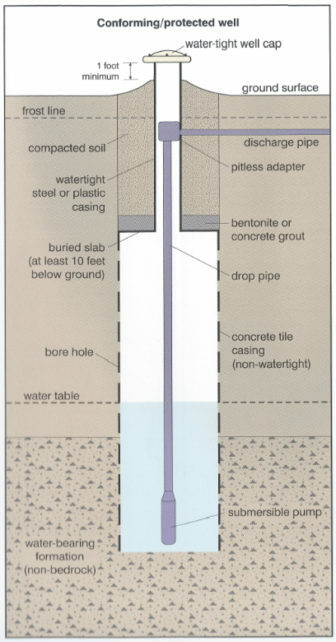 A typical sand-point well is shown in this Iowa Department of Natural Resources drawing. Another type of well susceptible to contamination is sand-point wells, where a pipe is driven into the ground to draw water from shallow, often unprotected aquifers, that is not protected by a layer of bedrock. Ron and Beverly Jensen, who live near Harlan in Shelby County, replaced their old 12-foot-deep sand-point well that had been in use for at least 40 years in October 2015 after water tests started to show that the water quality wasn’t good. They said the old well was prone to collecting runoff sometimes flooded. She said she thinks about the effect some surrounding farming operations could have on their water quality, but added “that’s just the way it is.” The Jensens’ well tested safe for coliform, e.coli and nitrogen when IowaWatch visited them. 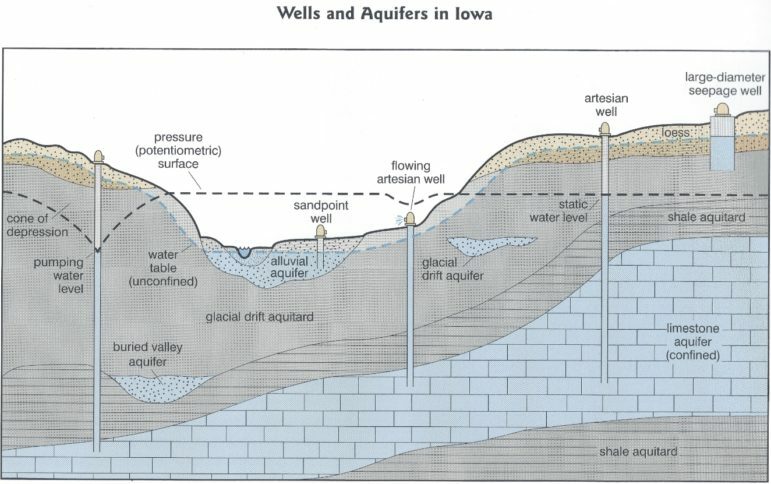 The most common type of wells in Iowa are small-diameter drilled wells, which are often cased with steel or plastic pipe. 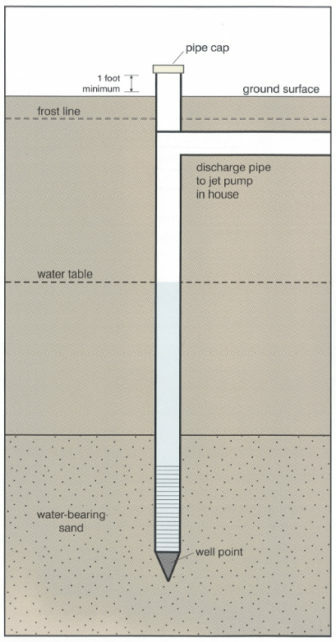 Well depth also plays an important role in how at-risk a water source is. State Geologist Bob Libra said water sources within 50 feet of the surface generally are considered to be more vulnerable to contamination. In karst areas, the bedrock has cracks, fissures and sinkholes that provide direct connections between the surface and underground water. Shallow wells in these areas have a higher risk for contaminants — like nitrates, bacteria and pesticides – because water doesn’t filter through layers of soil before reaching groundwater. Other areas of Iowa, including in the Des Moines Lobe, which reaches from north-central Iowa into the center of the state, are known to have naturally occurring high arsenic. Recent research and sampling have shown arsenic hot spots throughout the state, which can be hard to predict. This led the state to include arsenic testing in the Grants to Counties program and encourage well owners to test their wells at least once for arsenic. “If you’re in the wrong place and you happen to be in an arsenic rich zone, which unfortunately some arsenic zones are kind of predictable and some of them really aren’t, then you can have pretty high numbers,” Libra said. In statewide arsenic testing of public water supplies, Libra said arsenic appears in about seven or eight percent of source waters. Different areas of the state also have inherently different water quality in the available aquifers, with generally good quality water in the northeast, hit-and-miss water quality in the northwest and poorer water quality in southern Iowa, Libra said. However, within each of those areas, depending on the lay of the land, spots of relatively good- or poor-quality water can exist. 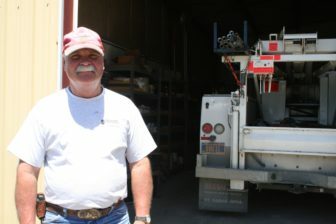 Gene Hicks, of Scranton, Iowa, has been working on wells since the 1970s as part of Hicks Well Company, which has been around for 60 years. Pictured June 21, 2016. Several well owners IowaWatch spoke with talked about switching to rural water utilities, which pipe water to areas previously not served by municipal water and are required to test their water frequently. But for many, not having to pay that monthly water bill is a strong incentive to stick with well water. Judy Strandburg’s shallow, hand-dug, 1930s-era well near Schleswig in Crawford County occasionally shows unsafe bacteria levels and somewhat elevated nitrate levels. Last summer, it tested at 46 milligrams per liter of nitrates, just one unit higher than the health advisory level. She keeps goats in the field surrounding her well but put up a fence to keep the animals, and their manure, away from the wellhead. Theresa Schlorholtz and her husband, John, periodically test their water from their sand-point well. The well goes about 23 feet deep into a shallow aquifer off the Missouri River, which flows just about a mile from their Fremont County home near Percival. They tested their water a while back and found high total coliform bacteria levels. “We were shocked,” John Schlorholtz said. “If you haven’t had a problem in 30-some years, you don’t think about it,” Theresa Schlorholtz added. IowaWatch tests during the summer showed safe levels for bacteria, e.coli and nitrogen. They said a rural water utility, Southwest Regional Water District, was collecting information in the area, but they weren’t sure if they were interested, although Theresa Schlorholtz said she would consider it for health safety reasons because water utilities test more often. But hooking up to rural water utilities isn’t always an option. Ben Schaben and his wife Jena moved into their house in Defiance along with their three kids a little more than a year ago and found the well has both high nitrate levels and bacteria. He said they had plans to put in a reverse osmosis system and a UV light to help address the issues, although a new well might be in the cards in the future. As a lifelong journalist and one who has also researched and written about private well testing and rural Iowa’s water quality, I must admit I fought back both tears and anger after reading this story. Yes, I know Ms. Shotwell admirably took 10 months to research and gather the data/interviews she presented here, but given this article’s statewide reach, she missed a premiere opportunity to educate our rural populations about how Iowa now tests at the highest levels — of all states — in Nitrogen fertilizer “Source Waters” contamination. I kept waiting for the article to cite the number of Iowans drinking Anhydrous Ammonia Nitrogen fertilizer-laden water and how rural residents are “not” warned to test wells for Anhydrous Ammonia and CAFO Nitrogen fertilizers, Atrazine, Cadmium, Lead, or other corrosive ammonias that draw lead into drinking water. Only in 2016 (after a complaint to the Cerro Gordo County Board of Health in 2004) were all Iowans finally warned to test for Arsenic; this came on the heels of a warning to 7,000 Cerro Gordo County residents. The article failed to cite a June 2015 incident (raised during a deposition for an ongoing civil rights lawsuit), that prompted the Attorney General’s office to promise that the Iowa DNR would set up a web site (“within 45 days”) giving Iowans access to known contaminants testing positive in wells, along with information about how to test for over 600 known contaminants. That was 20 months ago. Did the web site with those warnings come to fruition? It’s understandable, perhaps even reasonably expected, that not all Iowans concern themselves with unsafe drinking water. After all, we neither see up close what happens when aquifer recharge area sinkholes in other parts of the state get used as drains for 50,000 acres of run-off chemicals from nitrogen fertilizer, nor do we personally witness the mighty trickle-down toll on lives it takes from here all the way to the gulf’s Dead Zone, but being unaware doesn’t make a consequential problem any less real. Yes, Iowa is an agricultural state. Many of us townsfolk grew up watching herbicide and pesticide commercials on TV. Wasn’t all that just a part of farming? How little we knew. When my siblings and I used to visit our grandparents’ acreage and marveled at the “better-than-town” kitchen tap water, (no red water, no iron taste!) we never imagined Iowa had counties where feces spewed forth from kitchen taps and anhydrous ammonia burned one’s skin while showering. Must filmmakers, rather than the state, feel tasked with educating Iowans about what happens to people like Brown University graduate Adam Lack, 33, who dared to fight back against ongoing pollution plumes caused by landowners who use county aquifer recharge area sinkholes to illegally drain away Nitrogen fertilizer from tens of thousands of farm-ground acres? I sincerely mean no disrespect to Ms. Shotwell and understand the time and effort put into constructing such in-depth pieces. I’m just deeply saddened — shaken, really — thinking about those valuable 10 months allotted for this story and how it may have inspired much-needed action and life-saving change in north-central Iowa. Instead, it felt like watching rescue boats sail past the Titanic to ensure a few fishermen made it safely back to shore.